The Circle Never Ends: Songs of Our Faith. Sunday March 24, 2019, 10:15am in the FUUSN Sanctuary. 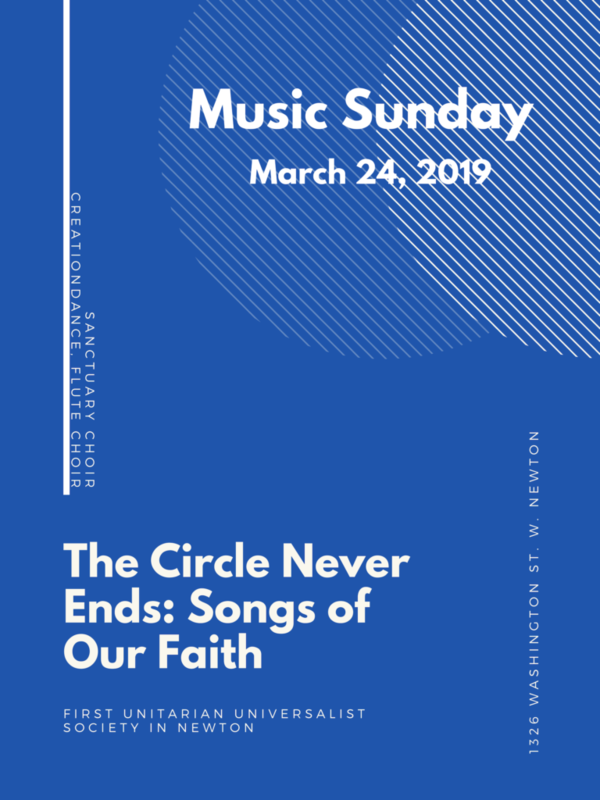 Our second Music Sunday of the year is March 24, and in keeping with the worship theme of Belief, the focus of the service is on: what are our core beliefs as Unitarian Universalists, and where does our faith come from? 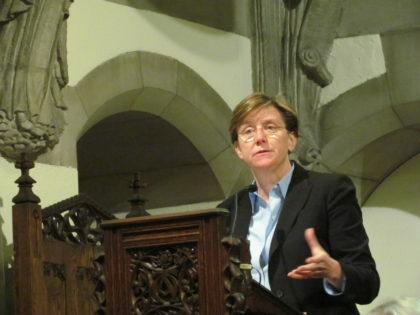 We’ll sing UU gospel music by composer Elizabeth Alexander, from her work Go Out!, “a musical celebration of liberal religion and freedom of thought.” We’ll also sing a rousing rendition of “I Sing Because I’m Happy”, reflecting Unitarian Universalism’s Judeo-Christian heritage. The Bottom Feeders (aka the Tenor & Bass Choir) and Higher Ground (aka the Soprano & Alto Choir) will sing, the Flute Choir will play, and CreationDance is creating a work on Leonard Cohen’s “Hallelujah”. Should be a rollicking good time! The Offering at the spring Music Sunday service supports the music program at FUUSN. 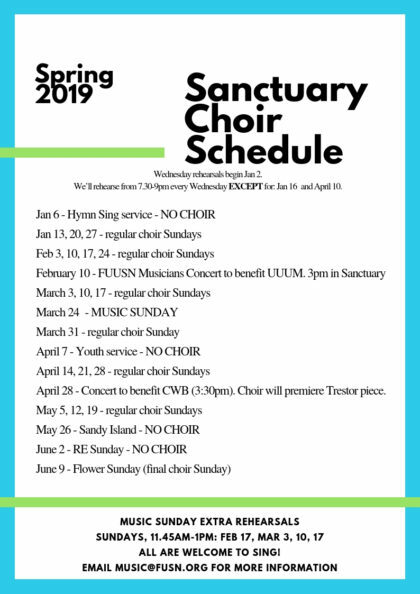 In addition to our very active Sanctuary Choir, several FUUSN ensembles have sprung from congregational impetus: the FUUSN Band, CreationDance, and the FUUSN Intergenerational Chamber Orchestra. The music budget includes monies for orchestras to accompany the choir on Music Sundays, and for occasional guest artists, which have included drummers from Mali, professional Baroque trumpet players, and Klezmer musicians. 2018-2019 has kept FUUSN musicians busy. We sang the Fauré Requiem at First Parish Church in Arlington, MA and at FUUSN; we performed John Kramer’s Immigrant Experience in Concord as part of a benefit concert for BIJAN (pronounced like “beyond”), the Boston Immigrant Justice Accompaniment Network, and sang it again at FUUSN (benefitting the Newton Brookline Asylum Resettlement Committee). In February we will host a benefit concert for the UU Urban Ministry; and on April 28 we’ll participate in the Communities Without Borders benefit concert.